London Arts Cafe is no more. Launched in 1996, activities ended in December 2007 and the charitable company was dissolved in Nov/Dec 2008. This site remains on line as a record of its activities. A meetup group, Art & Cities, was founded to continue similar activities, but closed after around a year. Unfortunately you have just missed this. Despite the terrible weather forecast, we enjoyed the walk with hardly more than a few random spots of rain. Canning Town and Silvertown was chosen as one of London's most impressive regeneration areas. Our walk included buildings and areas of interest and some exhilarating views of a new London that is emerging, and included one of London's newer squares, the superb Thames Barrier Park, possibly London's finest footbridge and a reminder of several disasters, including one that has changed the face of all of our metropolitan areas. If you missed this walk, take a look at the online version below. This includes photographs, informative text and sufficient directions for you to make this walk yourself. It takes around 2 hours (with an optional 1 hr extension) and starts and finishes at Canning Town station; you will need an Oyster or Travelcard as it includes several journeys on the DLR. London Arts Cafe no longer exists and the information included here is only for interest. attend London Arts Cafe activities free of charge or at reduced rates. submit work to our programme of exhibitions. your membership will support the London Arts Cafe initiatives such as 'Artists' Residencies'. Events not to miss include the City People Show (and its opening). Mike Seaborne, the curator of this major exhibition and Curator of Historic Photographs at the Museum of London, will lead a tour of this exhibition which bears witness to the story of London's black communities from the 1960s to today. See images of iconic events from Black Panther demonstrations to Bob Marley's visits to Britain. Admire portraits of international stars, such as Muhammad Ali and Peter Tosh alongside scenes of everyday life in London, from the streets of Brixton to the pubs of Notting Hill. £3 to members, £5 to non members. WHY IS LONDON THE WAY IT IS? The Gallery, 77 Cowcross St, London EC! After the AGM, Peter Murray, Chairman of Wordsearch, specialists in architectural communications, Director of the London Architecture Biennale and Exhibitions Director of New London Architecture (NLA) will give an illustrated talk. His position is that we must understand the past in order to plan and build appropriately for the future. Since the early days of the City of London, planning has been driven by commerce, thus London is a city of accretion rather tha of grand plans. The London Plan will work because it is drawn upon the palimpsest of previous builders. Events like the 'cow drive' at the London Architecture Biennale are organised to reinforce the fact that the streets of Clerkenwell are the way they are because of the drovers who came down from the north for 800 years. Free to members and their friends, but please book. The distinguished architectural historian John Newman, former Deputy Director of the Courtauld Institute of Art, who worked with Pevsner and has recently completed several new volumes of The Buildings of England has very kindly consented to take us on a Victorian Architecture walk around Covent Garden. The area retains an exceptional array of Victorian buildings in many styles with excellent examples of characteristic building types; clubhouses, and parsonages, schools and stained glass workshops, not to mention Covent Garden Market and Theatre, the jewels in the crown. 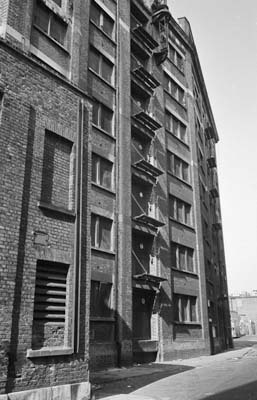 Today one can still sense the varied and vibrat character which this part of central London must have had in mid-Victorian times, thanks in no small part to the campaign in the early 1970s to preserve it from wholesale redevelopment. 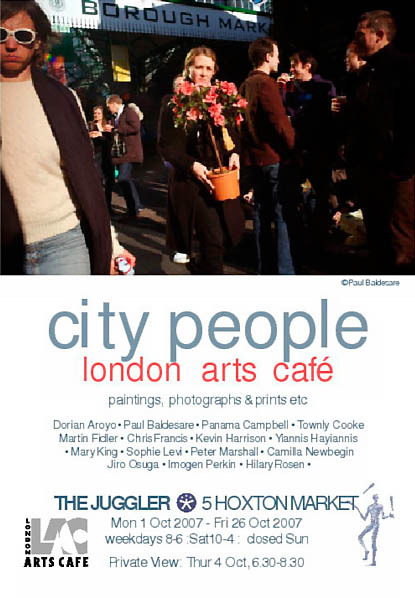 The Juggler cafe, 5 Hoxton Market, N1. Saturday 3 June - 12.00 noon. Michael Heindorff is an artist with a long-standing interest in cities as a subject for drawing. In 2001 the London Arts Cafe helped secure him a residency in the City of London which enabled him to make a series of panoramas from inside the top floors of church steeples and corporate tower blocks. The body of work was exhibited at the Guildhall Art Gallery in 2002. In 2004 a set of his work became the first solo online show on this site. Sarah Medway is an outstanding colourist who portrays an intimate understanding of paint, using both palette and brush to create a surface of depth and texture. She has exhibited widely throughout the UK, in the USA, Germany, Italy and Hong Kong. Her work features in both private and corporate collections including Linklaters & Alliance. Members only. £3. Book early as places are limited. 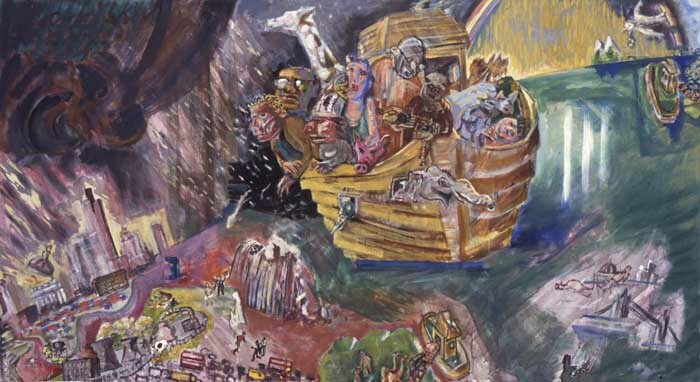 Mark Bills, Exhibition Curator and Curator of Paintings, Prints and Drawings at the Museum of London will lead a tour of this exhibition which imaginatively explores over 300 years of the visual humour of London. The development of the satirical print trade in London is examined in the display which in cludes a reconstruction of Mrs Humphrey's famous print shop in St James's. London provided more than just a backdrop for satire's human comedy; its areas and their associations were as familiar to its audience as the city gent or the chimney sweep. Just as satire mocked the strata of society, it also created a satirical topography of the city. Dangerous streets, fashionable haunts and the marginal areas of entertainment where wealth and poverty collieded were depicted by satirists who provided a comic and moral map of London. The exhibition was accompanied by a 16 page illustrated catalogue, still available. Photographs of a number of past events are on various web sites, including Peter Marshall's 'My London Diary'. In 'The Ghandian Ark', London, sin-city, is burning in the background. After the punishment by fire comes the deluge. The artist and his soul mates, led by Gandhi and St Francis escape the scenes of devastations in 'The Ecological Ark' (the original title) and head towards the Promised Land on the right.